Crawford County was created on March 12, 1800. It was part of Allegheny County and named for Col. William Crawford, considered to be a frontier hero. The county seat, Meadville, was named after its founder, David Mead. It was incorporated as a borough on March 29, 1823, and chartered as a city on February 15, 1866. Looking to further your research in Crawford Co.? 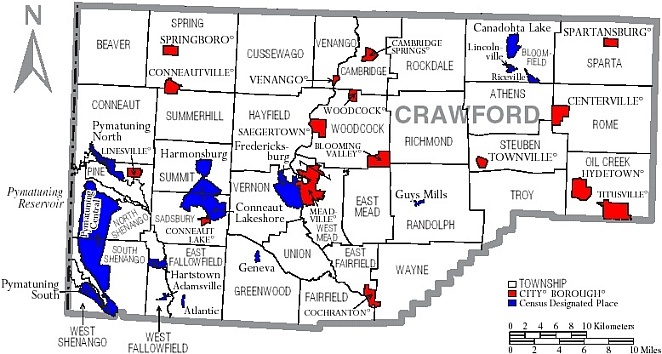 Map of Crawford County, Pennsylvania, United States with township and municipal boundaries is taken from US Census website and modified by Ruhrfisch in April 2006.